When it comes to gift wrapping I am a pack rat. I keep everything, even the Trader Joes bags, which I think are really pretty. I also scout out after Christmas sales and buy all the craft style close outs for the next year. The craft printed paper( top left ) is from Home Goods. The red & white bakers twine I bought for $12.99 at a craft store. I paper punch my own tags, and stamp them. I keep all my pretty papers in boxes and bring them out to see what I have. Then I just mix and match all my wrappings. I used the Trader Joes bags for the tops of my jars and for wrapping small presents, with the red & white stripe bakers twine. I also love to top of my gifts with vintage toys I find all year-long, and candy canes from the dollar store. The gift below I used fir, and an old white envelope. Pretty simple wrappings, and that way I can spurge on the gifts. 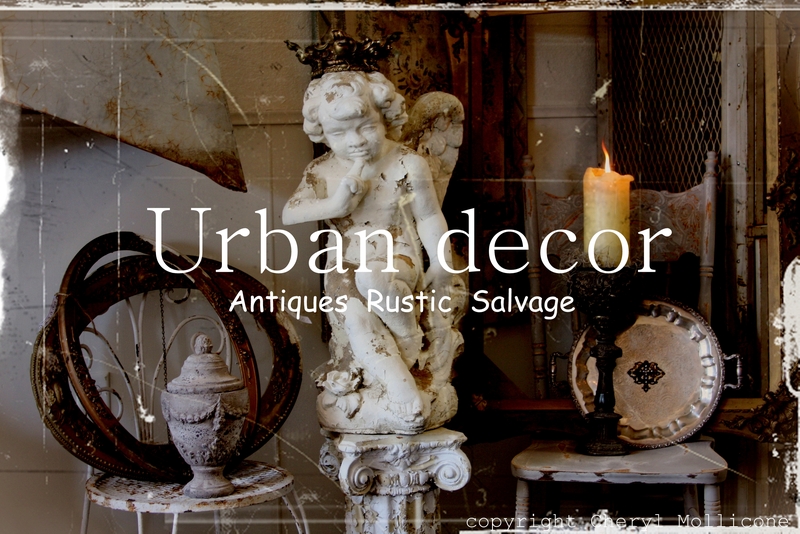 The Urban decor is a new store in Old town Lake Elsinore that sells eclectic antiques, rustic furniture and architectural salvaged items. This store is just plain cool. So of course I was very happy to shoot and create a unique custom business card for Leila of “The Urban decor. We shot a couple of different vignettes but decide this was the best. I darken the edges and used an overlay to create this very distress look. The postcard back has become one of my most popular backs because a business can use them as business cards and send them out for mailings too. All the information is on the back side so the picture on the front still looks nice. Simple, cool and unique. 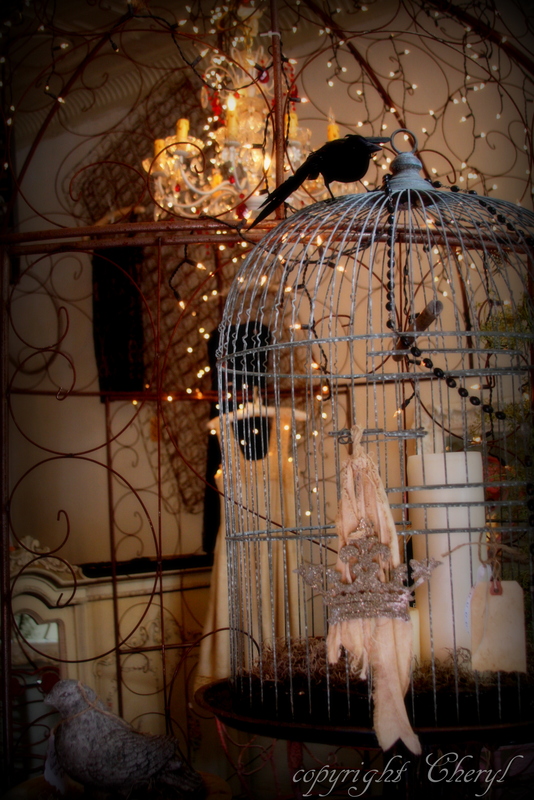 Make sure to stop by and visit “The Urban decor”. They are located at 112 S. Main st. Lake Elsinore, Ca. 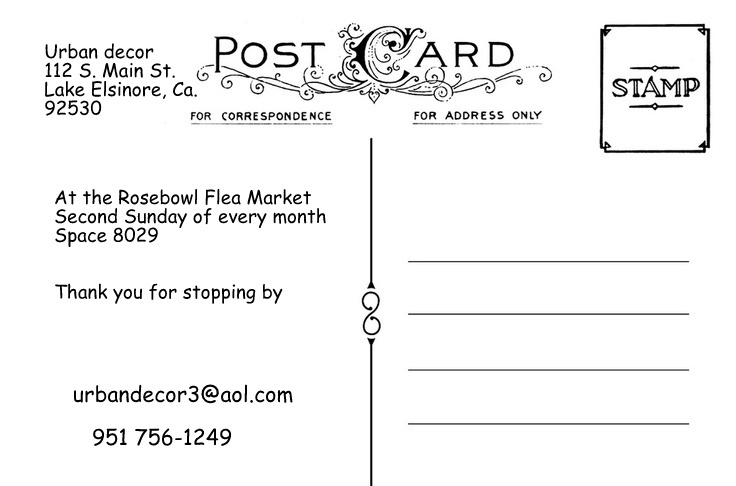 92530 They are also at the “Rosebowl Fea Market ” the 2nd Sunday of every month. Space # 8029. 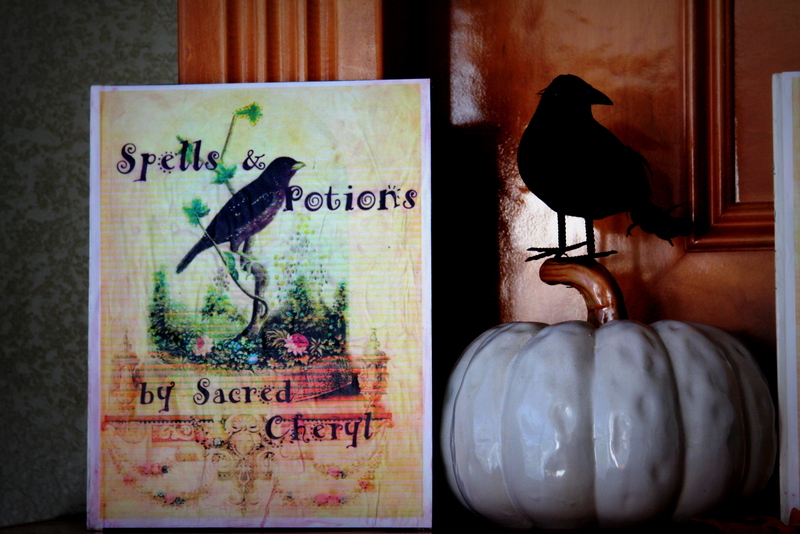 Please contact me if you are interested in a custom design business card at sacredcheryl@aol.com. My simple French tea started out with my dress form dressed for the occasion with a black corset and a white tutu with a black top hat. Maybe a little over the top but why not, it’s time for me to let my inner fun side out ! I wore my french skirt with my simple black top. Maria wore her french black and white tee with red pants and a little french hat. The banner was easy to make because I bought the flags from Micheal’s and just spray painted the letters black . 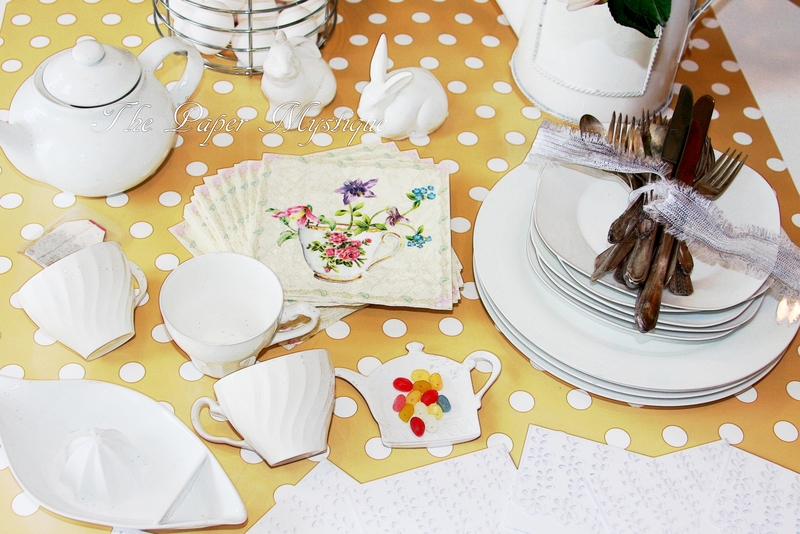 I used my mismatched silver and my mic-matched white china cups for the tea. I hand stenciled numbers on my white plates. 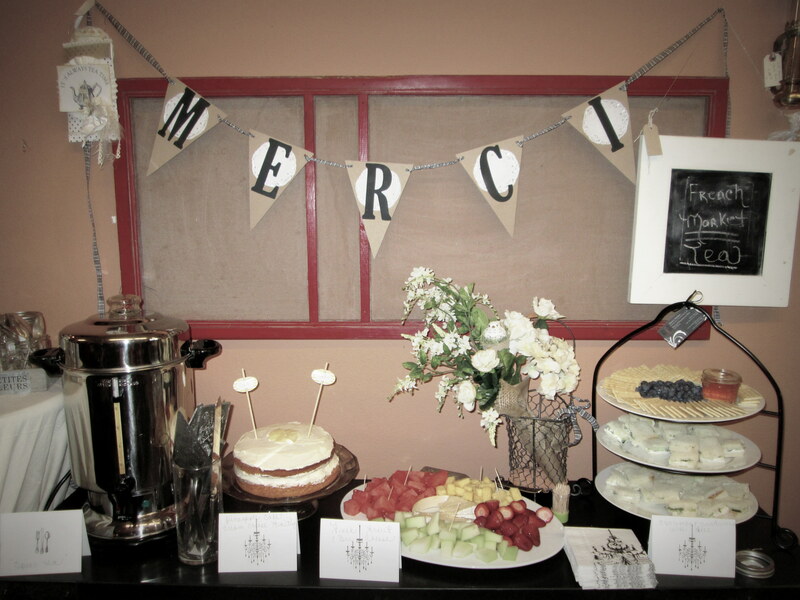 And I used a chandelier stamp for my napkins and for my menu cards. 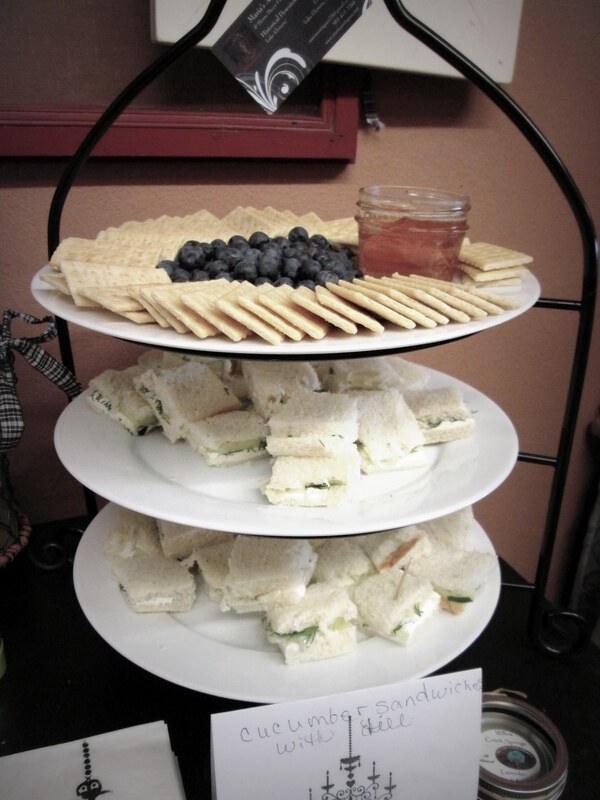 The Tea was a success and we loved serving tea and talking to all the ladies who came by. I was asked for my cake recipe. I used a store-bought mix and added pineapple juice (instead of water ) and chucks to the cake batter. For the frosting I used 1 stick of butter and 1 package of cream cheese at room temperature. Then I added 1 cup of powdered sugar and blended well. I garnished the top with pineapple chucks. A simple but fun tea, have a great week. I love paper ! So I decided to make my table runner out of white polka dot kraft paper . 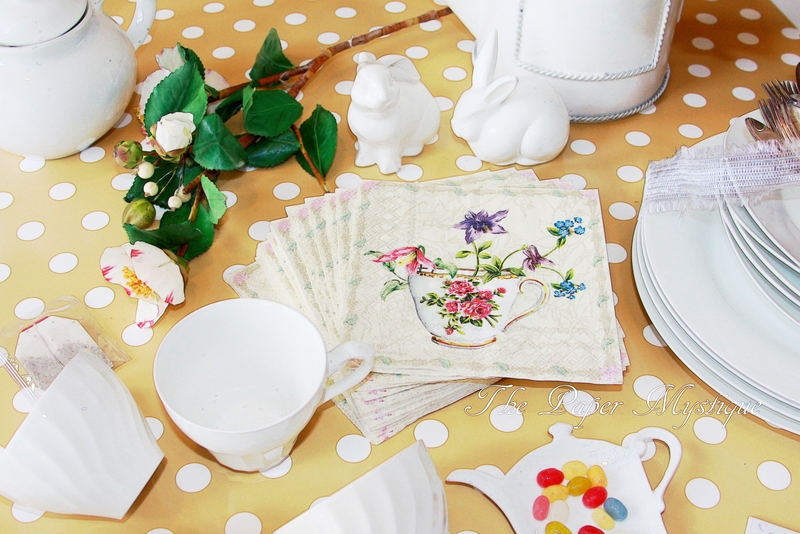 I added some fresh spring teacup napkins, some small white bunny and my white dishes to create a simple but fresh spring Easter table. 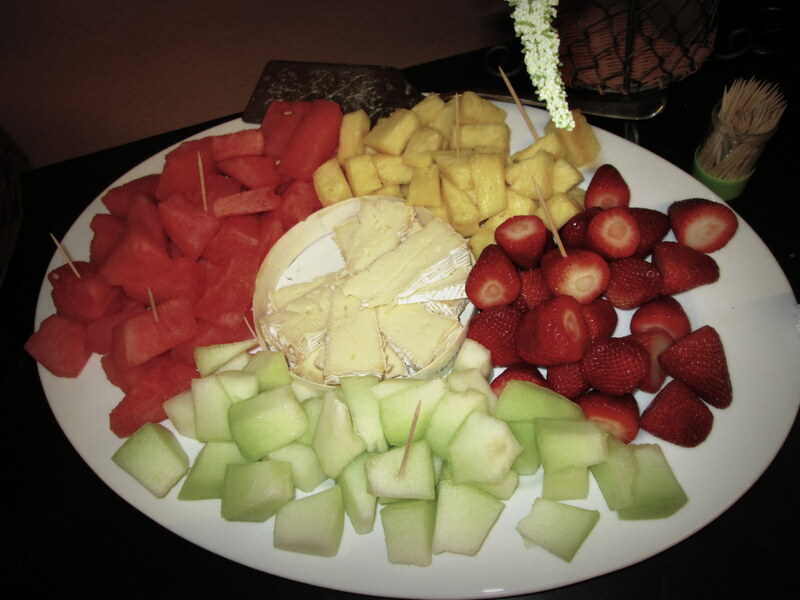 Whats nice about this color scheme is I can keep my eggs white and they look great in my french market wire basket. I decided to squeeze my orange juice and serve white tea. 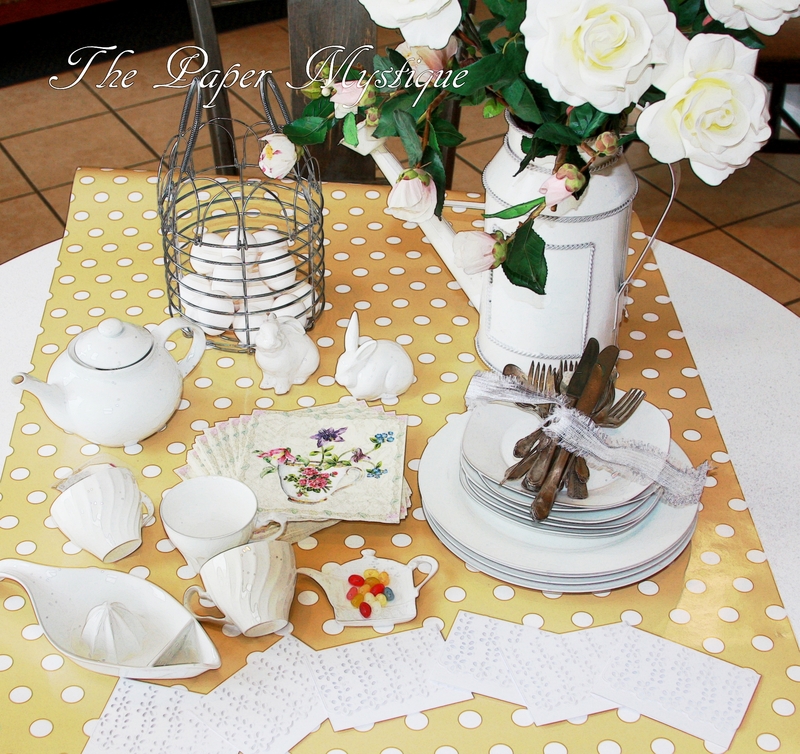 I picked up these white flower cut folded note cards at Micheals for seating . 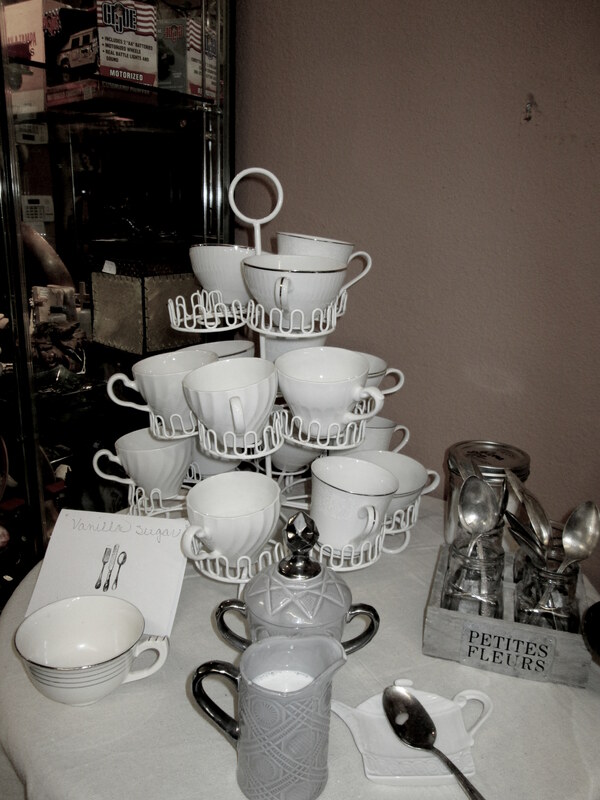 Old miss match silver, white tea cups and an old watering can I picked up at a thrift store. It had flowers painted on it so I spray painted it white . 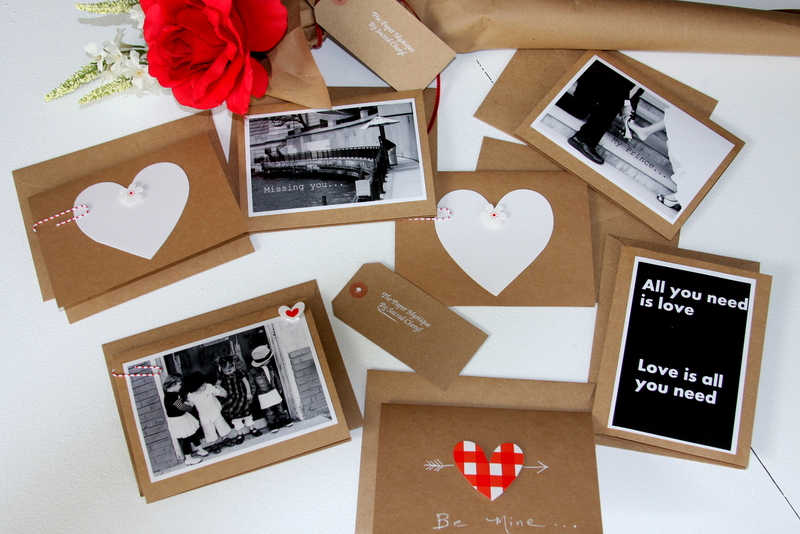 These are the cards I have created for my Paper Boutique. 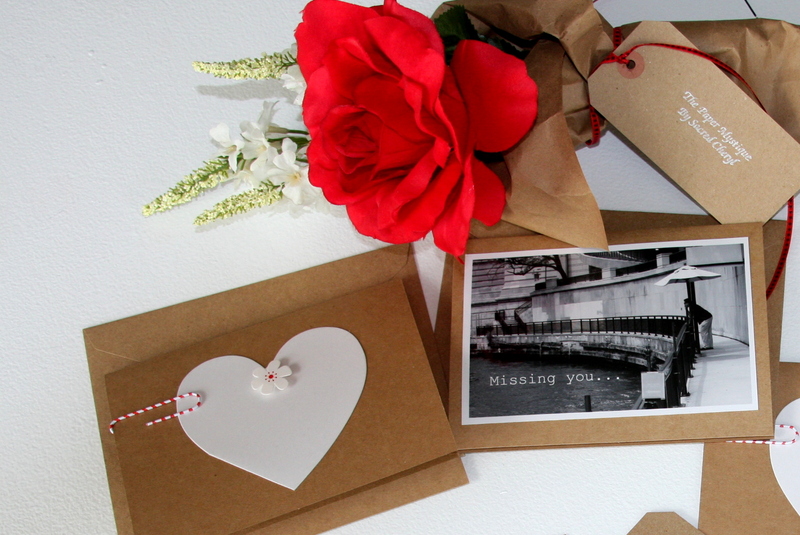 They are simple , pretty and for Valentine’s Day. 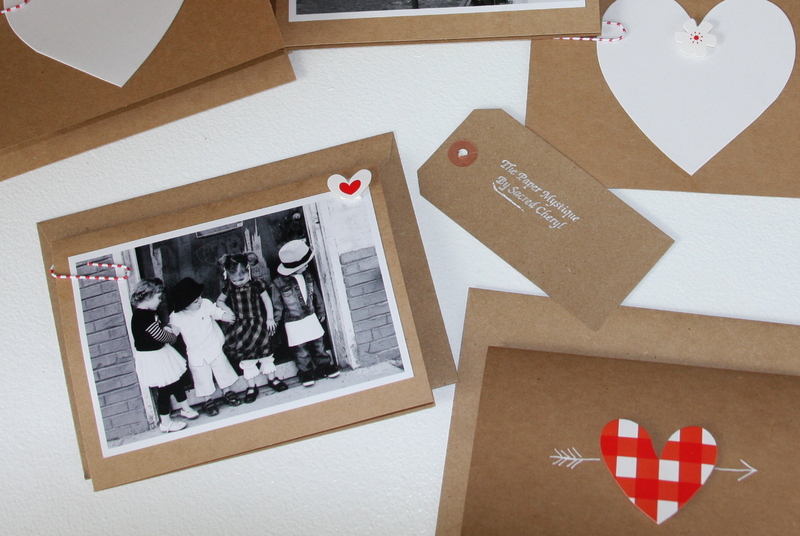 I used kraft paper cards, with my black & white photography, and some simple white hearts. I use the courier font for all my cards, as I use my vintage type writer. 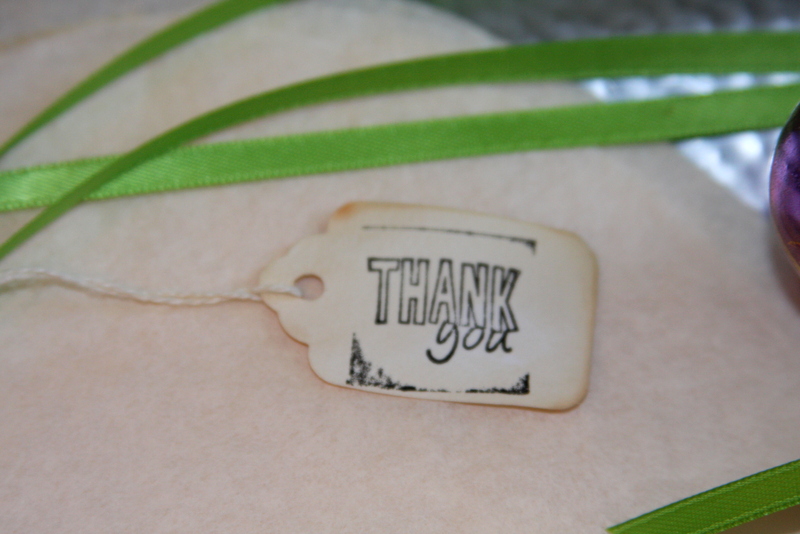 I like to embellish my cards with small details like a paper clip or small cutout . I love old books and jewelry. 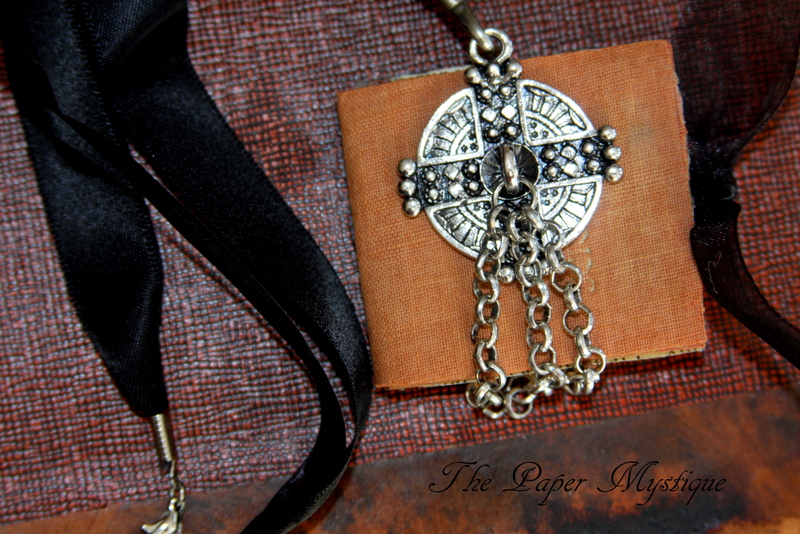 I have always wanted to make these mini books necklaces I have seen on pinterest . Something you would find at an old enchanting conservatory, left by the fairy’s of course. I used old book ends and old book pages to create this little master piece. I found this pendent from hobby lobby which I liked cause it give my piece a Renaissance look. 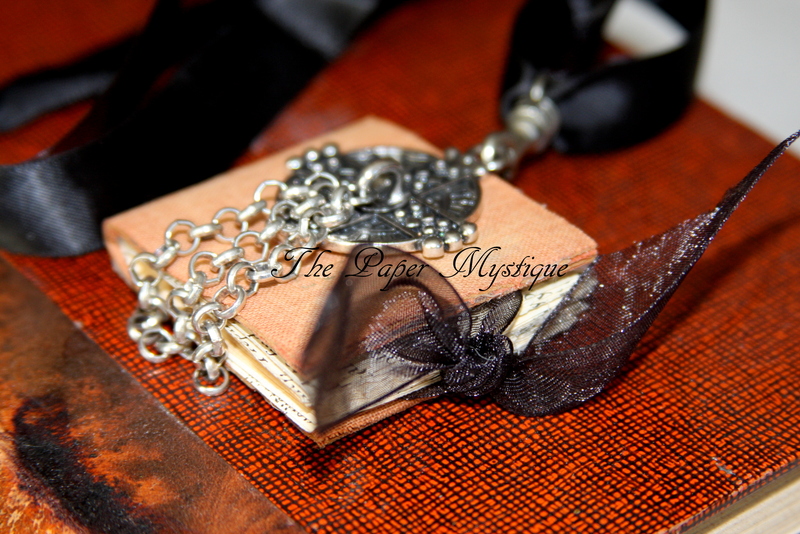 I attached my piece on a simple black ribbon with a clasp. 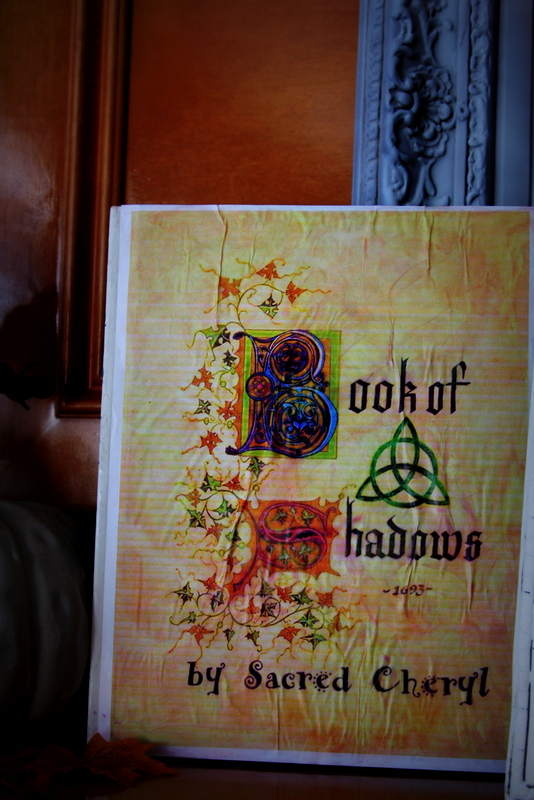 I used a sheer ribbon to tie the book together. 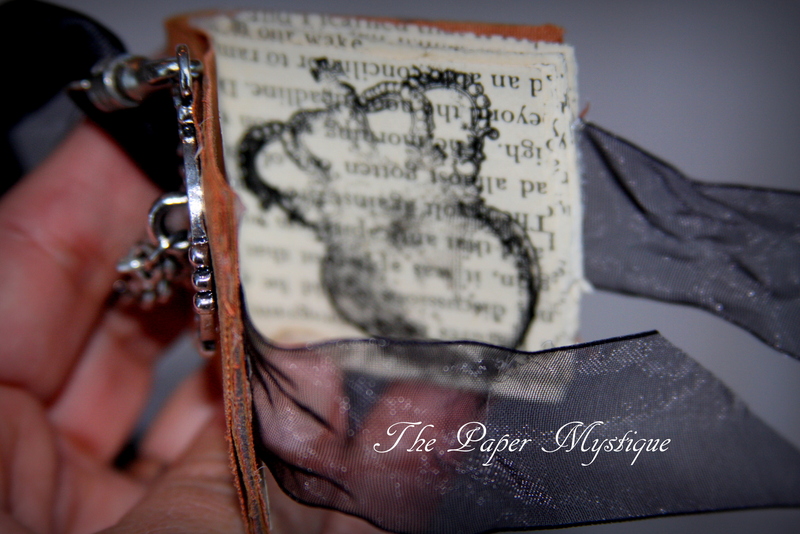 And when you open my little book , you will find a stamped Renaissance heart on the old pages. 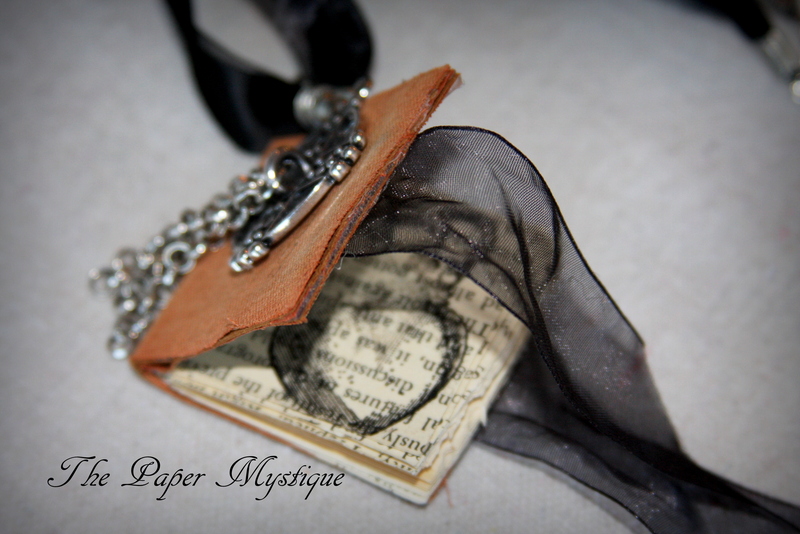 The perfect gift for Valentines Day, I will be selling these one of a kind, mini book necklaces at “The Paper Mystique. 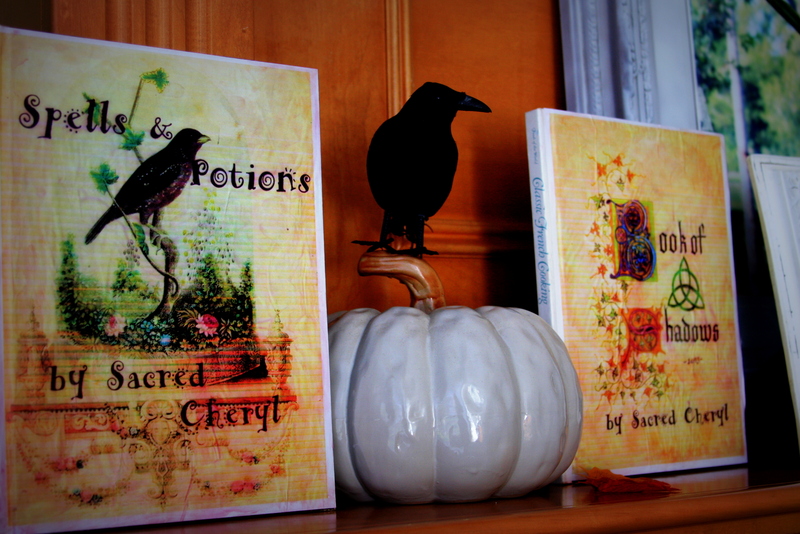 Here are my enchanting” Spells & Potions ” , & “Book of Shadows ” . I copied this print off my pinterest board (pretty papers ) and added my name and printed the page in color . I glued them with white glue and wrinkled the papers to give them a distressed look. I used some brown distress ink and rubbed the edges and the pages. I used some old cook books I found at a resales store , I paid about $5.00 a book . A simple and inexpensive project with big results. I can’t wait to do my “Big book of Wizards ! 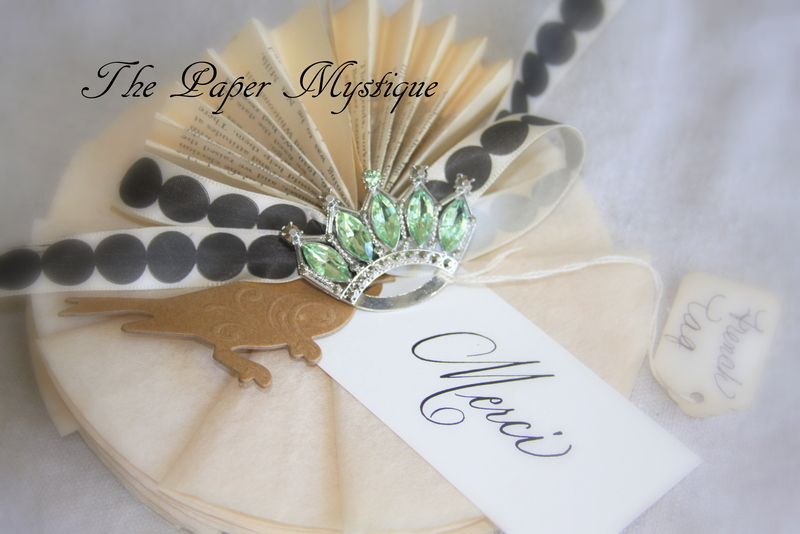 These are some items I am selling at my” Paper Mystique ” shop… some very pretty “Merci Tags”. 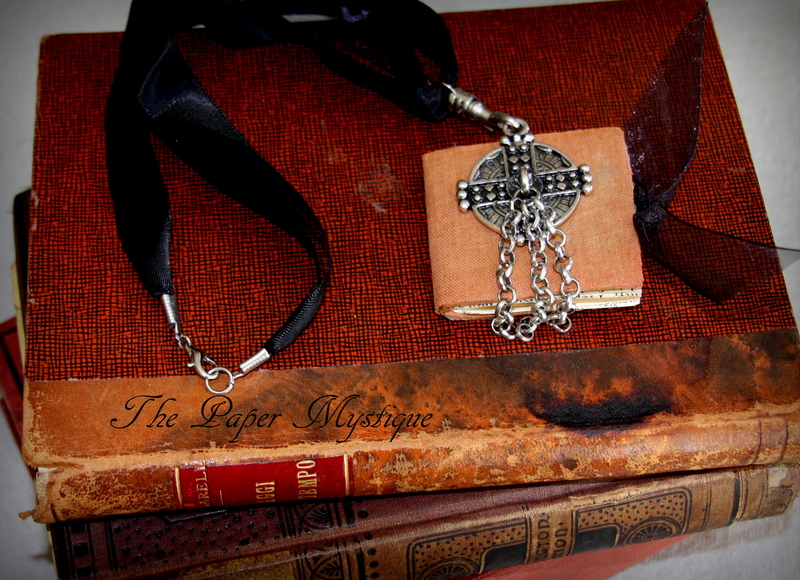 I made these out of tea stained coffee filters and old book pages with a brooch. I am very happy to say I will soon have a unique paper boutique. 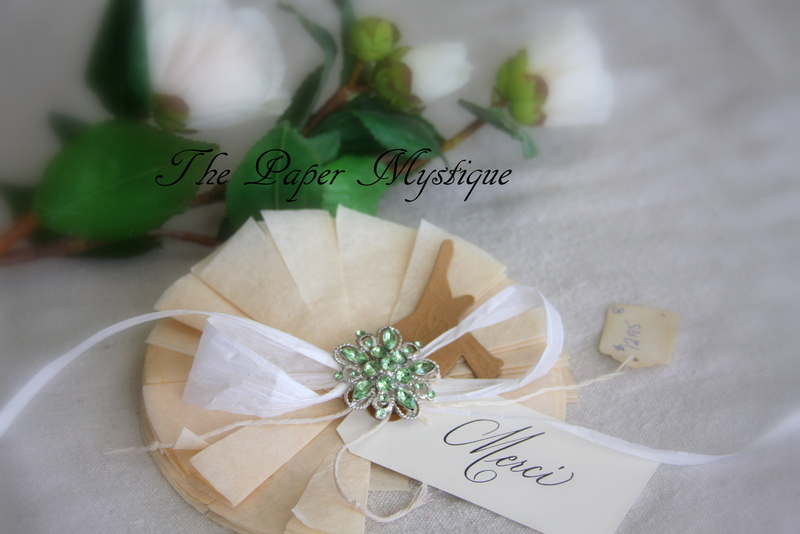 To open Nov 3rd…I will be posting more of my custom French papers. 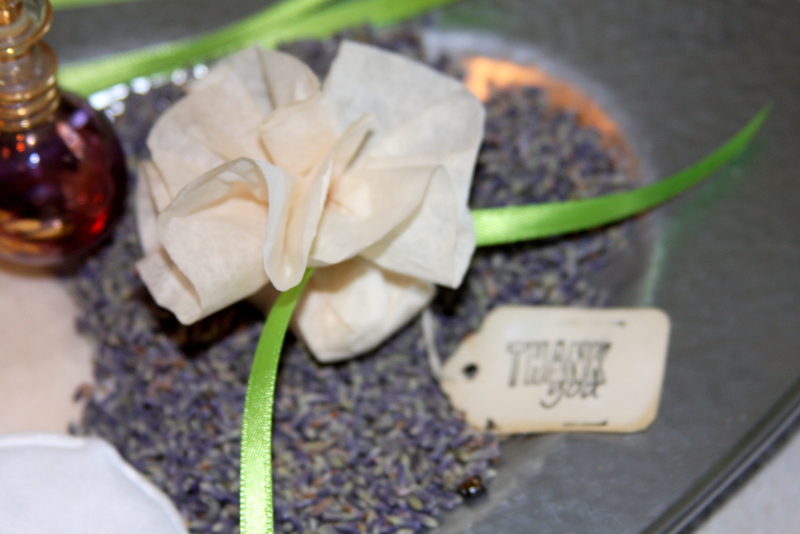 The gift of lavender is a special gift of luck. So I decided to do these for a baby shower favor. These are easy to make and very cost-effective. I tea stained the coffee filters and tags the night before and let dry completely. Here is what you will need. 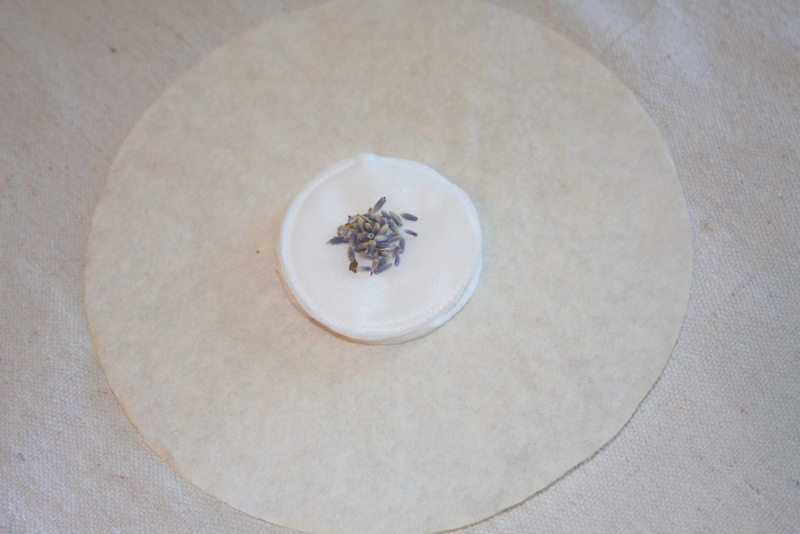 Lay the tea stained coffee filter out and put two white cleansing pads in the middle. 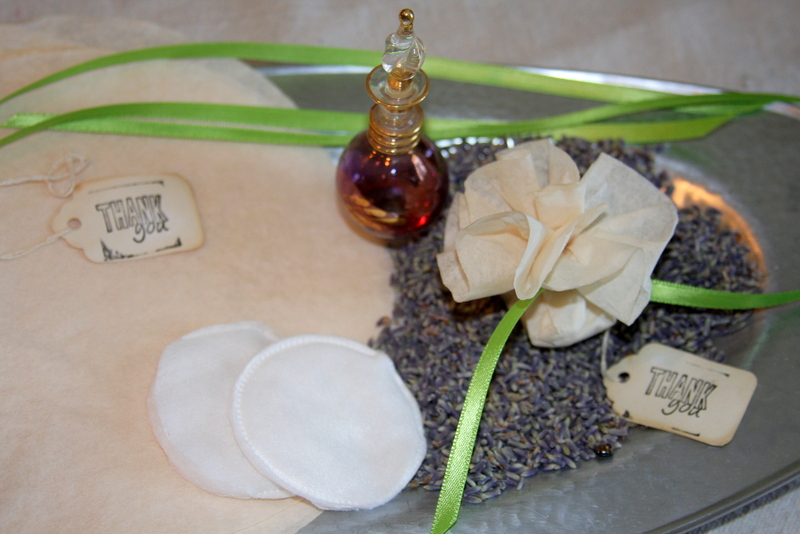 Add a couple of drops of the lavender oil, then add some lavender. Next gather the top and tie with the ribbon and the tag. Stamp the tag with your choice of stamp. Arrange the top to look like a ruffle. 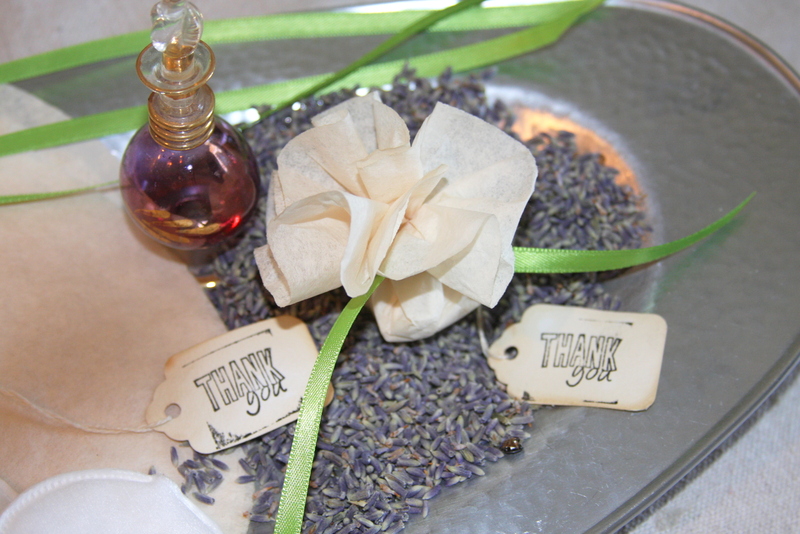 We are adding these to a blue card that has the date of the baby’s arrival and putting them on each guest table setting. The perfect gift for luck. 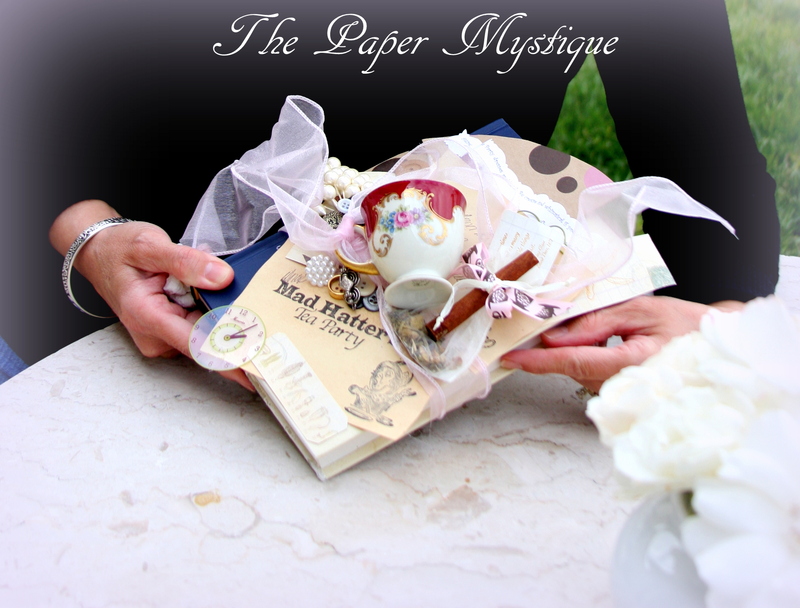 A paper book creation I made using the invite and wrapping paper from The Mad Hatter Tea party. 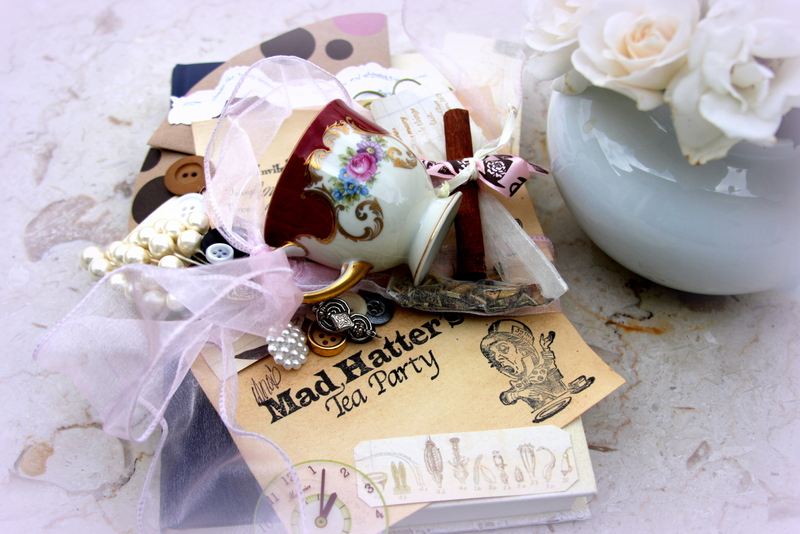 A keepsake for Doras Mad Hatter Tea party. 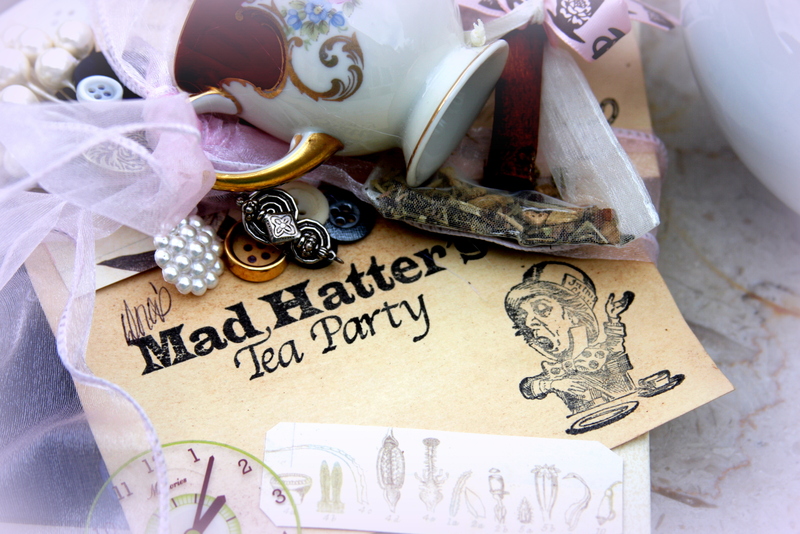 I added some ribbons, buttons, old clock faces, the tea bag from the party and an old small teacup from a thrift store. A special way to remember any party or event.